Average golfers these days have heard practically every gimmick in the book when it comes to new iron sets. Gain 20 more yards of distance today! Hit the straightest shots of your life when you buy this iron set! The list goes on and on, with the same thing occurring over and over again for everything from golf gloves to gadgets. While technology has allowed golfers to hit the ball farther and more accurate today than in the past, what really matters more than anything else is confidence. If you feel confident swinging the golf club in your hand and it feels comfortable, you will play better golf, period. One iron set that really stands out to me when it comes to being a “confidence booster” is the Cobra S3 Max iron set. What exactly does it mean for a golf club to be a confidence booster? Two things, the golf club needs to provide a fair amount of accuracy/forgiveness, and also needs to provide good distance as well in any lie. The Cobra S3 Max iron set fits both of these areas very well, which is somewhat surprising given that Cobra is more known for their drivers than their iron sets. Even more strange is the fact that the iron set is comprised of both hybrids and irons, all being stainless steel in nature. While Adams Golf may be known on the market today as having some of the best hybrid clubs around, Cobra certainly gives them a run for their money with this iron set. The first thing that will strike you when looking at the golf clubs the first time is their design. The iron set as a whole has a sleek, low profile design to it that makes it easier to simply focus on hitting the golf ball as opposed to making sure the clubhead lines are aligned correctly with the ball, and so on. It is a no-frills iron set that really puts Cobra in a leading direction moving forward. However, as we all know, one simply cannot judge a book by its cover, and the same applies to iron sets as well. A sleek design is a good start, but how do the golf clubs actually perform out on the golf course? Quite well I would say. What truly gives this iron set the label of “confidence booster” is the amount of forgiveness that the clubs provide in practically any kind of situation out on the golf course. Whether it is the hybrids or the irons, all of them allow for one to mishit the ball to a fairly large degree while providing a good amount of accuracy and distance to boot. What I was most impressed with when it came to the Cobra S3 Max iron set was how the clubs performed out of the rough. We have all had those situations out on the course where we hit a good drive that somehow ends up in the rough, and then we mishit the next shot out of the rough, leading to a terrible hole and day overall. With this iron set, one can easily turn it around into a great hole an day instead, as even though one may not get the contact that they want out of the rough every time, this iron set has enough forgiveness to keep the ball going in the right direction and with distance as well. Accuracy is one thing, but distance is another, and the Cobra S3 Max iron set performs well in this category as well, both out of the rough and in the fairway as well. What I liked most about the set was that every club seemed to provide a high launch, which is great for average golfers who may be struggling to get the ball in the air or who hate hitting high irons. The distance is very comparable to what one would find in iron sets that are nearly double the price, and then some. Cobra has done a lot to give their drivers a great amount of distance, and they have seemingly put that into their irons so that every shot just jumps off of the clubface. If you simply want to enjoy the game of golf more and stop worrying about playing so badly, be sure to give the Cobra S3 Max iron set a try. Who knows, you may actually find yourself wanting to play golf even more once you have played a round or two with these. 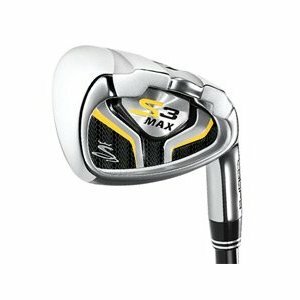 Take a look at some great deals on new and used Cobra S3 Max Iron Sets.